The following case studies represent a rich set of narratives about the digital literacy learning opportunities embedded in workplace contexts. They can be used to promote both an aspiration for digital literacy and a recognition of the benefits of work placements within academic courses. They are best used as contextual material, providing a background for further discussions, or as source material for helping develop digital literacy and employability aspects of curricula. The case studies have been developed as part of a research study into ‘Digital literacies for student employability’ at the University of Reading, focusing on extra- and in-curricular placement schemes, and using an approach adapted from Sharpe and Beetham’s ‘Developing Effective E-Learning: The Development Pyramid’ (2008). An interim report including relevant findings and recommendations to facilitate rich digital experiences in a WRPL context is also available. 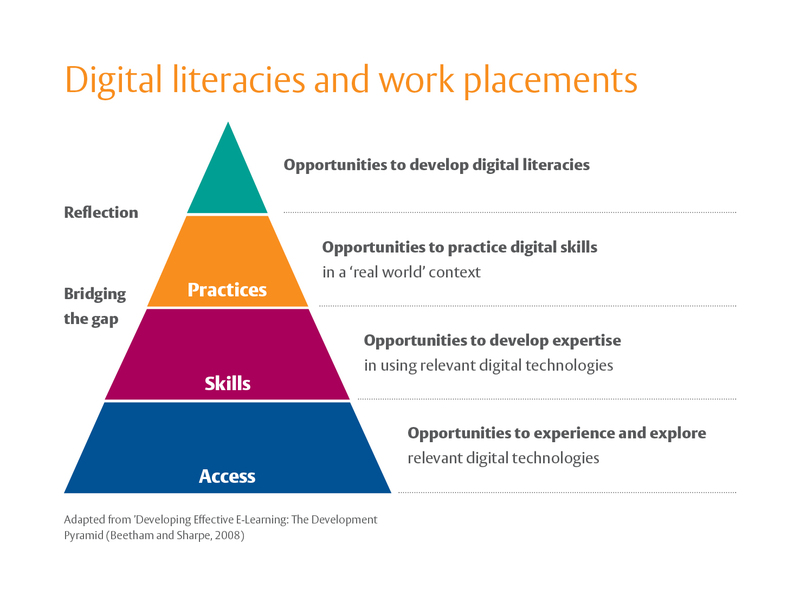 The framework we use to evaluate students’ digital experiences in workplace contexts is adapted from Rhona Sharpe and Helen Beetham’s ‘Developing Effective E-Learning: The Development Pyramid’ (2008). Work placements can provide opportunities for students to experience and explore digital technologies (access); to develop technical proficiency in using digital technologies (skills); and, crucially, to apply these skills in a professional, ‘real world’ context (practices). The value of work placements lies in making the link between students’ learning and applying those skills in a professional environment. Making this link in the student’s mind by encouraging them to reflect on their digital experiences and articulate what they have learnt from them, can help students develop their digital literacies and employability.